The Cabrillo Pavilion offers exactly what you are looking for when hosting corporate holiday parties in southern California. Built in the 1920’s the building has the white stucco exterior and terra cotta roof that Spanish-style buildings are known for, and the best part – it sits directly on the beach. Guests can enjoy the sound of the waves crashing on the ocean from one of the beachfront patios. And, minimum decorations are needed as the center’s art is displayed on the walls. A few white twinkling lights would stand out nicely draped against the beautiful wood-beamed ceiling and wrought iron chandeliers. The ballroom holds up to 200 for a seated event and the freedom to choose any caterer you desire. The center does not provide food or drink, but you are able to bring in both, including alcohol. The Cabrillo Pavilion offers you the stunning venue you need to get the party off on the right foot. If you are looking for a one-of-a-kind venue in southern California for a corporate holiday party the Maritime Museum of San Diego has exactly what you are looking for. Choose one of the four ships that the museum has for rentals, including the Star of India, which is the oldest ship in the world still sailing. The smallest of the ships can seat 30, with the largest seating up to 300. The museum has a list of approved vendors, assisting you with the selections of everything from catering to photo booth fun. Do you have your own favorite vendors in mind? No problem, with approval from the museum you are welcome to bring in your own vendors and entertainers. The Ponte Winery is the perfect place for elegantly rustic corporate holiday parties. Located in the Temecula Wine Country, Ponte Winery sits on around 300 acres, painting a stunning vineyard landscape that party guests will not be able to get enough of. The winery has multiple rooms to choose from while planning and the Restaurant at Ponte are very highly rated and has all the catering options that you could ask for. There are multiple rooms at the winery to provide you the perfect venue you are looking for. The Barrel Room allows 100 guests to enjoy the evening amongst wood barrels full of aging wine and the Vineyard Pavilion has everything from beautiful views through massive picture windows to a dance floor that guest can use to dance the night away. If you are looking for a trendier and hip venue, than the Andaz San Diego is what you are after. There is 18,000 sq. ft. of event space to choose from, including the largest rooftop event space in the city. 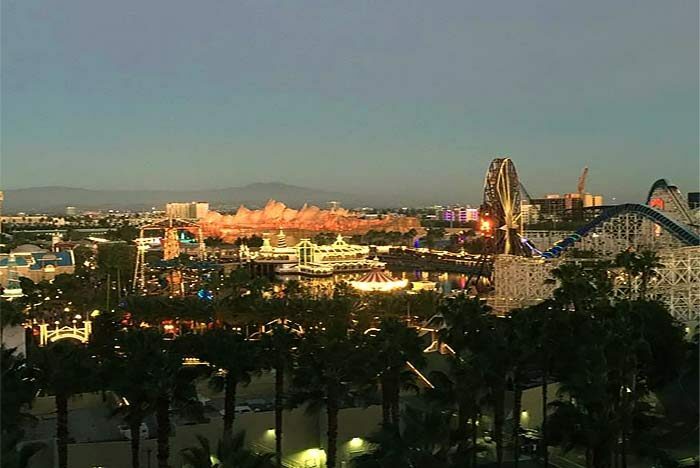 It makes for the perfect location for corporate holiday parties in the southern California sunshine, or with the shining lights of the city at night. You can take advantage of the dedicate catering staff to create a menu that is sure to wow. They will work with your theme and budget to create a customized menu that will help take your corporate event planning to a new level. What could be better than celebrating an evening with stunning views of the San Gabriel Mountains, lush gardens, and enough room for any size corporate party – large or small? If this sounds like what you are looking for then Santa Anita Park is the venue you’re after. Home of horse racing legend, Seabiscuit, Santa Anita Park is filled with over 100 years of horse racing history that will fascinate and captivate your guests. Whether you have a party of 6 or a party of 600, Santa Anita Park is the perfect place to host the event. There are rooms to accommodate all size parties along with cuisine to fit any budget. Options for outdoor seating is also available. This is truly a historic event venue that can be found nowhere else. If you are looking for a truly fun and unique venue, head back to the wild west at Regency Ranch in Palm Springs. This unique outdoor venue is set up as an old western town, with plenty of “Instagramable” photo ops. It has a saloon, church, jail, and hotel among other buildings. It’s the perfect setting to be dressed up with the popular outdoor event trend of pallet signs and burlap centerpieces. Tables can be set up in the town square and there are a dance floor and stage that can feature live music, a DJ, or an after-dinner show. The Palm Springs location makes Regency Ranch a unique off-site dinner event space for conferences and sales meetings taking place at some of the larger Palm Springs resorts. It gives attendees a chance for a casual evening of “wild west” fun. While most of these popular venues will have limited availability left for 2017, it is the perfect time to get a headstart on choosing your date for 2018 and beyond. Once you have that perfect venue secured, you will be one step closer to creating a totally memorable company party. Once you have your amazing Southern Californa venue reserved, contact our office to see how Chris Linn can provide an evening of unforgettable clean comedy magic that will fill that perfect venue with laughter and cheer. We have first-hand experience helping to provide entertainment for dinners and events at the above venues, as well as hundreds of other convention centers, ballrooms, and banquet spaces across California. Jimmy Buffett famously sings, “If we couldn’t laugh, we would all go insane”. Laughter is continually proven to be one of the best ways for employers to help their employees let off some steam, and planning in some comedy into a holiday party should be as important as picking a venue or hiring the caterer. In fact, hiring comedians and comedy entertainers to entertain at corporate celebrations are among the top holiday party trends for 2017. As the stress of work, politics, and news of the world piles on, there is no doubt that we will all be able to benefit from a few good laughs, come December. Instead of offering employees an outing to a comedy club following a company holiday party, bring the club atmosphere to your celebration by inviting a comedian to emcee the evening and provide a short performance. The idea of building humor into corporate gatherings coincides with another current trend affecting the workplace year-round: recruiting and retaining employees by paying attention to what they want. Forbes indicates that achieving this happiness requires good communication throughout a company and a “big-picture” sense of corporate direction. It also may depend on the company atmosphere that values a good, clean laugh that harms no one. Whether chatting with coworkers on a regular day in the office or selecting a comedian when planning a company Christmas party, the challenge is to keep the humor clean. Winter, who worked in the corporate world for many years, and often writes about how to navigate its wild waters. While working as a manager, she boiled down her rule for workday humor to this nugget: Keep it PC and PG. So, when hiring comedians for your company holiday party, consider whether their material would pass muster with the audience you must please and the Human Resources Manager you will have to pass in the hall in the morning. A comedian can do a lot to entertain guests at a holiday party. But to create a lively atmosphere that builds corporate comradery, you need to give guests the opportunity for humorous interaction with each other. This includes icebreakers and fun interruptions within the flow of the event. Planning Pod, a software company that focuses on the events industry, reports that one of the biggest trends and challenges for gatherings in 2017 and beyond will be how to compete with people’s cell phones. The digital company predicts that rather than chiding party-goers into turning off their smartphones in 2017, event professionals will find ways to build technology into shared party activities by using the phones as controllers for games, polls and other content on overhead screens. One digital ice-breaker to consider is the Just Dance 2017 program that allows players to use their cell phones as controllers that communicate their moves to video screens. It connects to screens with video game devices and can be manipulated by cell phone through a Just Dance app. Here’s another digital idea: When it’s time for a speech by the CEO or another company leader, the talk might conclude with a fun quiz — including questions about the corporation — presented on a large video screen. Quiz software similar to kinds used in education and at corporate meetings lets participants use cell phones to answer questions. Icebreakers can also be the old-fashioned kind that gets people talking with tablemates. For example, at a sit-down dinner, place a fun, unusual question beneath each person’s glass or tableware. The party emcee can get the conversation rolling by announcing where to find the questions and explaining a few rules for the activity. You may want to provide a small timer for each table so everyone gets a turn to speak. Not every company has a budget to host a big holiday “extravaganza”, but activities to keep guests entertained and laughing should not be ignored. Something as simple as a “white elephant” gift exchange can be a fun and funny activity for smaller groups. In a “white elephant” gift exchange, each attendee bringing a “white elephant” gift costing less than a set amount, such as $5, to share with someone else. Traditionally, the gift is something funny or silly, but they can be something practical or unique. When considering live entertainment at your event, you may not be able to afford to bring in a national act to entertain your holiday party guests, but you may still be able to find a local professional within your budget. NOTE: While you may be able to find “cheap” local entertainment, is important to still find “professional” entertainment. You don’t want to risk your entire party on “uncle Dave” who tells a few jokes and does a few tricks. You can also control entertainment costs by booking the entertainer directly with the management company or through their official website. This will help you avoid online agency fees and “finder fees” that are associated with many large online event planning websites. Hiring a professional comedy entertainer is an investment in your event. After all, the funny memories are what people will remember and talk about at the office long after the party is over. Dates for the 2017 corporate holiday party/employee Christmas party season are booking up quickly in Chris Linn’s calendar. The peak holiday party season typically runs from mid-December – mid-January. For 2017, the peak dates for company events will be December 1, 2017 – January 14, 2018. Based on past years, the most popular dates to host a holiday party will be December 1-2, 7-9, 14-16 and January 5th and 6th. Many companies will be competing to book the best venues and entertainers for these popular dates. As of February 2, 2017, Chris is already booked to perform at 12 company holiday parties across the country, but there are still openings for some of the “prime” December dates. Note: Dates have been updated below as of 9/6/17 – Remaining dates are booking quickly. Chris’ 2017 current company holiday party schedule. 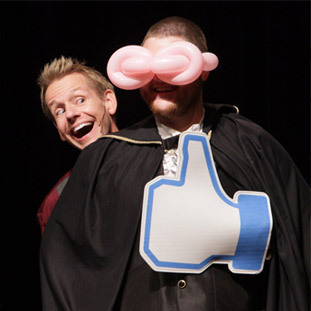 For the past 17 seasons, Chris’ energetic, corporate comedy show has been popular among event planners looking to bring unique and exciting entertainment to their employees and guests at their Christmas parties / holiday banquets. His past corporate clients have included: Honeywell, Ford, DuPont, Snap-On Tools, Anthem Healthcare, Chevron, the Federal Bureau of Investigation, Jack Link’s Snack Foods, Con-Agra Foods, and literally hundreds more. Chris’ many years of experience has allowed him to easily adjust his show to fit almost any size venue. In a given year, the size of the audiences Chris performs for may range from 25 people in the meeting room of company’s corporate headquarters to 400 people in a resort hotel’s ballroom. In an effort to help make budgeting for employee party entertainment easier, fees quoted for 2017 corporate performances will include the performance fee, airfare, ground transportation and other misc. travel and meal expenses (excluding hotel accommodations). This “all inclusive speaker/entertainer pricing is becoming more popular in the event industry, as it eliminates the hassles and unpredictability of travel expenses that are billed after an event. Travel arrangements for Chris’ corporate engagements are handled by Chris’ staff, with the exception of hotel accommodations, which are usually requested to be arranged by the client. To check updated availability and performance fees for the 2017 holiday party season, contact Chris Linn’s booking office or provide your event information through the online request for proposal form on the official Chris Linn website. The all-new Chris Linn Online Store is now open! It’s our virtual “merch table”, where you can buy all the t-shirts, DVDs and other souvenir items from Chris’ shows. Additionally, the store will also be featuring some limited edition and online-only items designed by some of Chris’ favorite graphic artists. To celebrate the opening of the store, we are offering free standard shipping on all U.S. orders through August 1, 2017. Are you still reading this? Go buy a t-shirt!